The bull threatening Luther with excommunication, Exsurge Domine (“Arise, O Lord”), was published on June 15, 1520. It represented the culmination of several precipitating factors. First, the initial charges against Luther demanding that he recant of his opinions in the indulgence controversy were never laid aside. Despite the requirement that he answer for his opinions in Rome or recant of them before Cardinal Cajetan in Rome, the controversy continued and Luther’s criticisms only sharpened. Second, the selection of a new emperor freed Rome to shift its attention from political concerns back to Luther. Third, the Leipzig Debate with John Eck in the summer of 1519 raised the question of papal authority more directly and necessitated a response from Rome. At the time, Luther was still relying on the protection of Frederick the Wise in Wittenberg. With the election and pending coronation of Charles V, Frederick had lost some of his bargaining power with Rome, as well as his status as “imperial vicar” during the interregnum. For the elector, there was the possibility that he and his university might be excommunicated or even receive the imperial interdict if he were found guilty of harboring a noted heretic. As a result, he sought the legal opinion of his jurists and laid the groundwork for how he might defend himself against the accusation. In several meetings during the winter months of 1520, the case against Luther began to take shape. A consultation that included Cajetan was formed in February and began to detail Luther’s errors, though distinguishing between his teaching and his person. This would provide room to recant rather condemning him personally. When Eck arrived in Rome in the spring of 1520, he became a leading contributor in the formation of the bull. 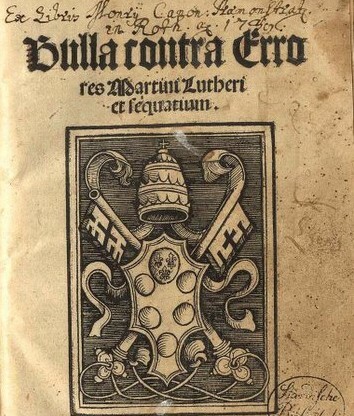 He reported on Luther’s more fervent opposition to papal authority and drafted a list of forty-one errors Luther held, which were added to the draft already produced by a committee in Rome charged with addressing the issue. It was Eck who later delivered a final draft of the bull to Leo X for his signature while the pope was out hunting. Exsurge Domine famously referred to Luther as a “wild boar from the forest,” an unsubtle statement of the tensions between Rome and Germany. The list of forty-one charges ranged from Luther’s doctrine of penance that brought him into the public eye down to the Eucharist, the keys, papal authority, and purgatory. The bull laid out the efforts on the part of Rome to deal with Luther previously, proscribed the reading of all his works—even those lacking his noted errors—and commanded him to cease preaching immediately. It concluded with a call for Luther to recant of his condemned opinions within sixty days or face excommunication. Two nuncios, Eck and Jerome Aleander, were commissioned with spreading the bull throughout German lands. While the bull itself did not technically excommunicate Luther, it came with significant ecclesiastical and political consequences. Rome mandated that all in the church reject Luther’s teachings or face excommunication themselves. This extended even to books that did not contain errors because they were associated with Luther as an accused heretic. There was also the possibility that princes supporting Luther, in particular Frederick the Wise, would be subject to imperial edict, or the “greater excommunication” that carried with it civil as well as ecclesiastical penalties. Upon receiving the bull, Luther did not offer a defense. Instead, on the sixtieth day after its receipt, by which time he was to stand trial or be excommunicated, Luther ceremonially burned the bull along with the books of canon law, which included traditional church decrees and papal bulls, as well as the glosses of medieval jurists. In this Luther symbolically rejected the ecclesiastical and legal system he saw supporting papal authority.